In business since 2001. D.B. Containers understands that the customer comes first and they need to feel confident with who they are doing business with. 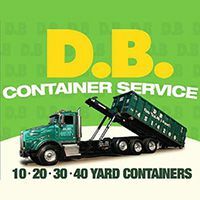 We are capable of serving anyone from an average home owner to general contractors in a variety of services including: clean-outs, roll-off containers, demolition and excavating. Over the years, our business has grown as a result of the many long-term relationships we have established with our customers. Through honesty, fairness, and impeccable service we continue to look forward to creating relationships with new customers.